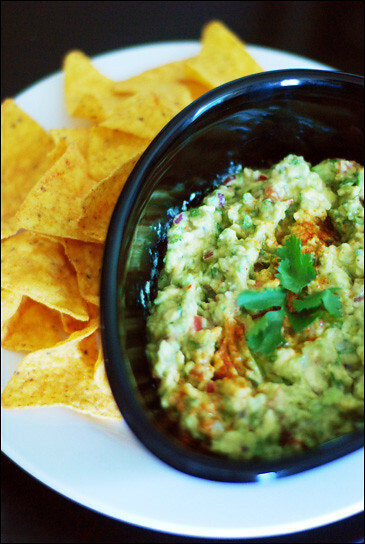 As promised, a recipe for guacamole. Apologies for the lack of blogging but sometimes real life gets in the way. I made this partly by way of displacement activities (essay writing on sunny days is no fun) and partly because I was hungry. I used to consider guacamole a bit of a last resort - something to do with avocados that have been hanging around a bit too long and are too soft/bruised to serve as salad. The unsightly slightly brown flesh is off-putting to look at but doesn't effect the flavour too badly, so is perfect for guacamole. I like my guacamole a bit more rough and ready than most. If you'd like yours more like a dip, put all the ingredients into a food processor - it'll make the end result much smoother! Slice the avocadoes in half and scoop out the flesh into a mixing bowl, add the lime juice and olive oil and chop until all the avocadoes are in small pieces. I find it easiest at this stage to mash the avocado with a fork to get it to the consistency I like best. Next, place the tomato in a bowl of boiling water for one minute, then peel. Slice in half and discard the seeds and core, then chop into small pieces and add to the avocado. Finely chop half a red onion and de-seed and finely chop the chilli and throw these into the mixing bowl. Finally, finely chop the coriander, add to the bowl and thoroughly mix all the ingredients together. Season with salt and pepper to taste. Garnish with a sprig of coriander and a dusting of paprika, then serve. I like my guacamole best with freshly warmed pitta or corn chips, but it's also delicious as part of a fajita burrito.